The Luxury Travel Ltd. (http://www.luxurytravels.asia/) has been chosen for the most prestigious honor from the annual Guide Awards 2012-2013 (which are considered the “Oscars” of the travel industry) and has been named “The Finest and Most Innovative Travel and Tour Operator”. Hanoi, Vietnam, August 16, 2013 – Vietnam’s first luxury tour operator (www.luxurytravelvietnam.com) has been recognized for excellent performance and included in the Best of the Guide Awards 2013. 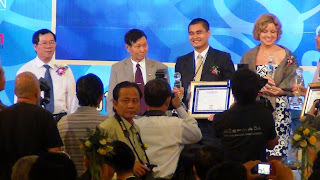 The Awards are sponsored by the Vietnam National Administration of Tourism, the Vietnam Union of Science and Technology Associations and the Vietnam Economics Association. The Guide Awards is an annual event to celebrate the best products and services in Vietnam’s tourism and hospitality sector. This year marks the 14th anniversary and will take place on Thursday, August 22, 2013 at Vinpearl Luxury Danang. The Guide Awards Ceremony is to honor excellent achievements in the tourism industry in 2012 – 2013, as well as the best travel agents/DMCs in the field. The honorees are initially nominated by readers of the life style and luxury magazine, with the shortlist presented to the executive board of the Guide. Travel, hotel, restaurant and shopping experts are invited to assist the board in making their decision;this includes representatives from the Ministry of Culture, Sports and Tourism of Vietnam. This year Luxury Travel received a Guide Award with the title “The Finest and Most Innovative Travel and Tour Operator”. This recognition was due to the fact that Lux is innovative and creates a great working environment for its people, as well as applying new technology to improve quality and operations processes. The have been publishing new websites designed for travel sellers, publishing brochures and luxury travel guide books, and venturing into new markets. All of the innovation initiatives are aimed at delivering the most authentic luxury travel experiences for the most sophisticated travelers. This is the sixth consecutive year that Luxury Travel has been recognized by luxury travelers for excellent performance. “We are much honored to receive the Guide Awards 2013 for the 6th consecutive time. This prestigious accolade is a wonderful recognition of our pioneering role and continuous innovation in luxury tourism in Vietnam and in the Mekong sub region. We are proud of our 99% of satisfaction rate, yet we will keep aiming for double digit growth, as we have just set up a new premium travel company in Cambodia.” said Mr. Ha Pham, founder and CEO of Luxury Travel Ltd.
Every year, the company sees growth of about 30% percent and serves some 10,000 travelers, ranging from high ranking diplomats to leisure travelers. Luxury Travel Ltd. has served the luxury travel industry for many years, and their staff has acquired first-hand knowledge about the luxury travel market in Vietnam. They have visited their recommended destinations, and have personally checked out the finest hotels, resorts and restaurants designed for discriminating travelers. “Education and continuous innovation are the lifeblood of our company. Our mission statement is to provide “wow” services to the most sophisticated travelers. Our goal is to continue to raise the bar in service and further develop Vietnam and Cambodia as luxury travel destinations. Our vision is to become the leading tour operator and DMC in Vietnam by our 15th anniversary in 2020 and one of the Asia’s leading luxury tour operators, with a potential IPO thereafter. ” added Ha. Serving today’s most sophisticated travelers, Luxury Travel is exceptional in designing tailor-made tours, providing unique travel experiences and luxury travel products in Southeast Asia (Vietnam, Laos, Cambodia, Myanmar and Thailand). Opened in 2004, the Luxury Travel Company Limited has its own offices, luxury vehicles, luxury travel advisors, and representative offices in California, London, Paris, Sydney and Argentina. The company’s depth of experience and large infrastructure enable it to create unique itineraries with the operational confidence to fulfill clients’ expectations. This entry was posted in News on August 20, 2013 by Richard Parks.